It’s the last thing that I put in my bag, but the most important one. A 15-year-old, yellowed copy of one of my most prized possessions — an unabridged version of the diary of the girl who taught me, among many other things, the power of words. This finds a place safely in my backpack. I’m on my way to Anne Frank’s hometown, and am most excited to take out time to visit her house in a quiet lane of Amsterdam. But as I sit reading my tome in the comfort of my business-class seat on the eight-hour Jet Airways flight that takes me to my destination, little do I know that I’m going to leave my heart behind at more places than one. As the plane descends at Schiphol Airport, I spot several windmills within the vast expanses of green. And that very morning, we’re treated to close-up views of these marvels at Zaanse Schans. 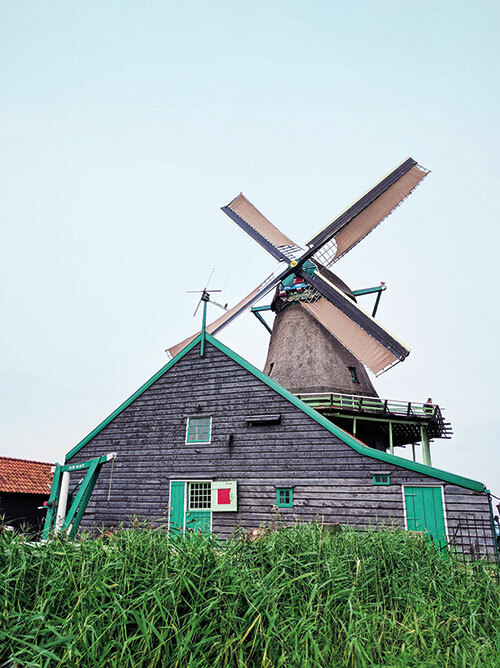 With the vibe of an open-air museum, this residential area along the River Zaan — that once housed over 1,000 windmills — is today home to but a few of these wooden machines. Ducks wading through the calm waters, charming little houses in greens and yellows, a clog workshop, and the aroma of cheeses wafting through the air — in that moment, I feel like I’ve entered an 18th-century Dutch painting! We head into the still-functional De Kat paint mill, which was constructed in 1664, and where the smells of oil and sawdust continue to permeate. Treated to a small demonstration on how the mill operates, we head up the steep wooden ladder to the roof, excitedly posing for photos with the sails spinning in the background. The Zaans Museum nearby takes visitors through the history of the locale, through Dutch crafts, artefacts, and even a showcase of Claude Monet’s paintings inspired by this village. 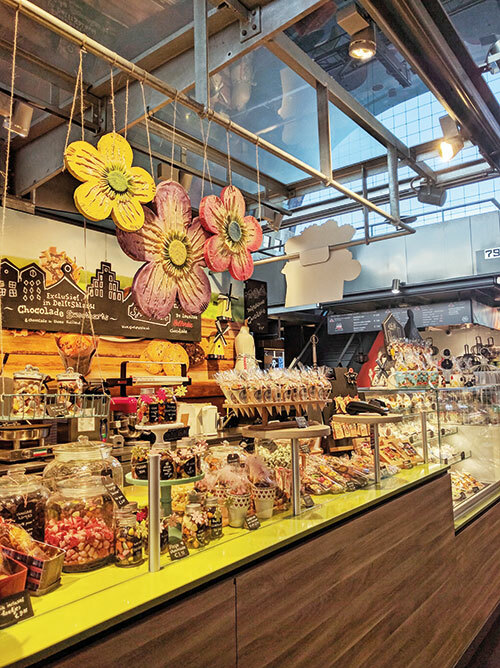 While we make our way to lunch, I pop into every little shop and bakery I spot on the way, tempted by the aromas of chocolate, melting cheese and stroopwafels (crunchy waffles with a caramel-like filling). Even their packaging has artworks on them, one more beautiful than the other — leaving one spoilt for choice! Our first meal in Amsterdam is at De Kraai restaurant which, I discover over the course of the afternoon, is a delight for pancake lovers. From ham and cheese, pineapple, and cherry and cream to apple and bacon, the mix of savoury and sweet pancakes leaves us both completely stuffed and hungry for more! The bus ride to A’DAM Tower and lookout point takes us through the main city, and though I’m tired enough to take a nap, the sights around keep me enthralled. Walls are beautified with street art, carts of colourful wooden tulips abound, and even some zebra crossings are in the colours of the rainbow! At our stop for the evening, while my fellow travellers are lining up for a ride on Europe’s highest swing, my scared-of-heights self decides to enjoy the panoramic view from the observation deck. The open-air deck has telescopes for anyone who wants a closer view of the canals, bridges and buildings. I instantly locate Anne Frank Huis (Anne Frank House) on the map that runs along the railing, and get a view of the historical building. Visiting this place with my much-loved book in hand has been on my bucket list, and I note that I must explore it during a free afternoon. For now, I satisfy myself with the faraway glimpse from the city’s highest point. 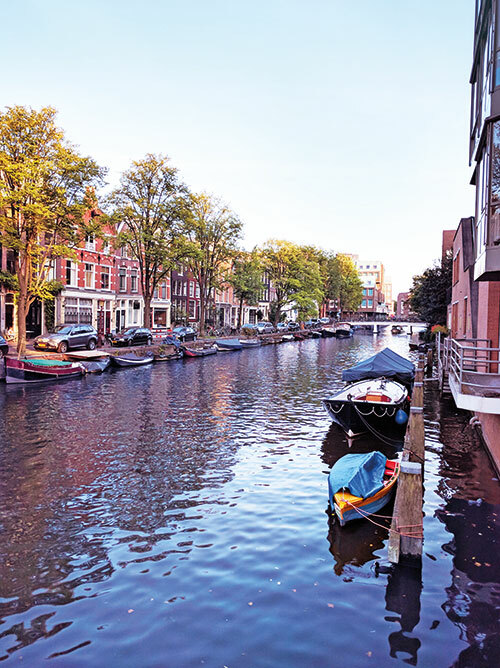 As we enjoy a boat ride along Amsterdam’s famed canals lined with pink and white blooms, the glorious sunset enhances the picturesque moment, and I want to sit there forever. Anne’s notes from her diary are playing on my mind: ‘As long as this exists, this sunshine and this cloudless sky, and as long as I can enjoy it, how can I be sad?’ Truly, how can one not love nature’s gifts, of which the Venice of the North has aplenty? I sit at the breakfast table sipping on some delicious, thick chocolate milk (the best I’ve ever had), and going through the itinerary, I’m excited about our visit to the cultural square. As a lover of all things historical and artistic, I want to see as much as possible. Quite disappointed after being told that it’ll be “mighty difficult” to assure entrance into Anne Frank House without having a ticket months in advance, I choose to spend my time exploring the other delights of the city. The bus drops us outside the Rijksmuseum — one look at the facade and I’m already in love! The gorgeous building is divided into two spaces joined by an arch, and the first sight of the structure leaves you in awe. 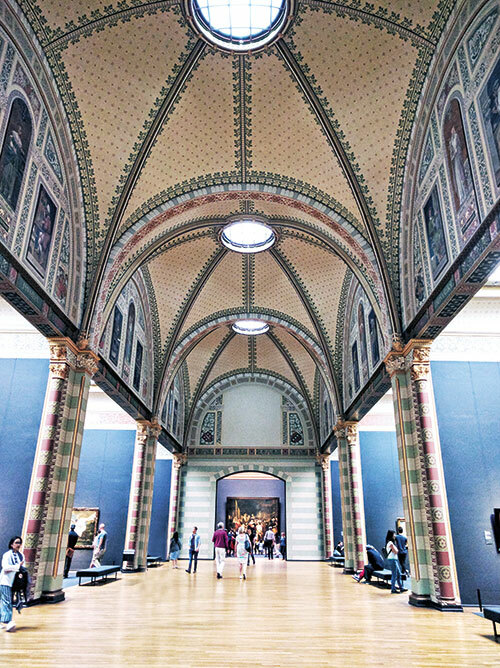 The Netherlands’ national art and history museum, this 19th-century monument is home to the greatest works of Dutch creators, from Rembrandt van Rijn and Johannes Vermeer to Jan Steen and Karel Appel. After taking in the expanse of the main atrium, I head to the galleries. Crossing off The Battle Of Waterloo by Pieneman and Vermeer’s Milkmaid from my list, I make my way to the second floor gallery that houses the museum’s pièce de résistance. Rembrandt’s Night Watch is, by far, the most majestic and captivating painting I have ever seen. Several minutes are spent admiring this magnum opus, and I leave the museum a happier person, with a miniature replica of the artwork (also printed on the ticket stub I saved) and a Claude Monet wall calendar tucked in my bag. A date with Van Gogh at the eponymous museum a short walk away is a treat for anyone who loves the Starry Night artist. His Sunflowers, Almond Blossom, Self Portraits and Irises are all found on the gallery walls, and you can lose yourself in his creations for hours. My favourite? The museum covers the artist’s life not just through his works, but by telling his story through letters, drawings, and art by those who influenced him through the years. Sipping on my heavenly hot chocolate on the pebbled path beside a quaint little cafe, I’m lost in my thoughts about the weekend I just had. No, I didn’t get to visit the house where my childhood hero once lived, or see pages of the original diary she maintained. But I stood on the roof of a functional windmill, took a boat ride through the romantic canals, fell in love with art museums, bought miniature versions of Vermeer’s Girl with a Pearl Earring and Rembrandt’s Night Watch and gorged on stroopwafels. And when I’m back, I’ll discover more corners of this cultural haven that holds pieces of my heart. Anne Frank Huis on the banks of the Prinsengracht canal being the first. explore the three-year-old Markthal — a residential and office building, which is adorned by a 11,000-square-metre artwork, the largest in the country. End your trip to the seaport with a view of Piet Blom’s famed cube houses. If it’s where the royal family lives, it has to be grand. The seat of the Dutch Parliament, The Hague is known for its distinctive architecture that dates back several centuries. Take a walk through the historical centre, and explore the surroundings of the Binnenhof, where both houses of the state meet. A complex of stunning Gothic buildings next to the Hofvijver lake, the parliament is one of the country’s most popular heritage sites. 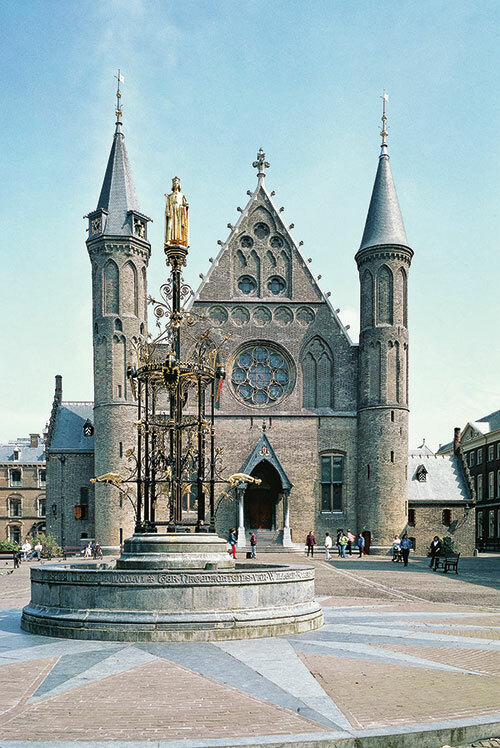 Explore the Ridderzaal (Knight’s Hall), and enjoy a photo op in the courtyard against the neo-Gothic fountain with the gilt statue of William II. The art deco building, Gemeentemuseum Den Haag, promises the best of art and fashion, and also houses the world’s largest Mondrian collection. Stop by the Paleis Noordeinde for a glimpse of the home of the current monarch, or stroll through the palace gardens behind. And for your dose of graphic art, head to the mansion called Escher in the Palace, where you can see a permanent exhibition of Maurits Cornelis Escher’s work. Read about 4 museums you need to visit in Holland here.